Finding a platform to sell your eCommerce goods on can be a royal pain. Thankfully, the SaleHoo team has done their research on each eCommerce platform with one common goal in mind: To help you get started. Today, we’re focusing on one in particular: Amazon! In this post, we’ll explain how to set up an account (as well as what to do if you aren’t a U.S. citizen), how to list products, how to ship your items, and what you need to know about those pesky Amazon fees. Which countries can sell on Amazon? While Amazon caters to most countries, it does not cater to all. To see if you’re able to sell on Amazon from the get-go, take a look at this list. Didn’t see your country on the list? Don’t fret! We have the solution you’re looking for in the next paragraph. While you’ll be able to set up a store on Amazon even if your country isn’t listed, you won’t be able to collect your earnings made. If you have any questions about this process, ask your local bank about the information needed. Now, let’s create your account. Setting up an account on Amazon is easy as pie. However, there are guidelines you must follow to ensure you’re getting exactly what you need from your Amazon account. Let’s talk about the two different types of accounts first: Individual and Professional. Individual Amazon accounts are great for smaller sellers who only offer a few items at a time. If you don’t plan on opening a full-blown eCommerce store right away, I recommend you choose this account plan first. So, how does an Individual account work? Are there fees associated with this account type? Can you do whatever you want to do on an Individual account? First thing’s first, let’s talk fees. While you aren’t charged a monthly subscription for an Individual Amazon account, you are charged $0.99 after every sale you make. While this may not bother you in the beginning, it will harm your piggy bank after a while. Especially if your items aren’t selling and you want to put them on sale! Not to mention items you initially list at a low price. Don’t forget to think about your shipment fees! It’s a good idea to calculate the amount of money you’ll make after taking shipping fees and $0.99 out of the equation. Second, what can you do with an Individual Amazon account? Are you able to upload as many pictures as you’d like? Can you access your annual reports with a click of a button? With an Individual Amazon account, you’re only given basic tools to help you kick-start your business. You’re not able to apply to sell in categories where approvals are needed, for example. Obviously, this is pretty restricting. That’s where professional accounts come in. Professional Amazon accounts are perfect for experienced eCommerce stores that sell a lot of inventory in a short amount of time. Sound like you? Read on to find out if a Professional Amazon account is right for your eCommerce store! If you have an Individual Amazon account and you sell 40 items in one month, 40 X $0.99 = $39.60. At that point, you’re basically paying for a Professional Amazon account! Multiple Listing Creations. Instead of being limited to one listing, you’re able to create multiple listings while using spreadsheets and uploads (this feature is not available to sellers with an Individual account). Inventory and Order Management. With a Professional Amazon account, you’re able to use reports and Amazon feeds to see what’s selling (as well as what isn’t) and you’ll be able to get a quick look at your inventory to see how many items you have left! With an Individual Amazon account, you can only access the online listing and order management (which means no reports or feeds for you). Loads of Access. Want to go to the Amazon Marketplace Web Services to upload feeds, receive reports, and perform API functions? A pro account will get you that. Now, I’m not trying to upsell Amazon’s Professional account by any means, but if you believe your eCommerce store is going to be a hit, it may be a smart move to start out with at this level. On the other hand, if you’re just trying to make a few bucks on the side and don’t see your store going too far, an Individual account is the better choice. Like always, the choice is up to you! Let’s say you decide to start with an Individual account to see how you like it (and to see how well your items sell). Great news! They’re selling! Suddenly, you find yourself kicking yourself for not getting a Professional account from the get-go. No worries! You’re able to upgrade your account with the click of a few buttons. Go to your Seller Account. Click the “Account Info” link under the Settings heading. On the Seller Account Information page, go to the ‘Selling Plan” section and hit “Modify Plan”. When this brings you to the next page, hit the “Upgrade Plan” button. Carefully review the information provided, then click on the “Proceed To Upgrade” button. There you have it! You now have a Professional Amazon account. How exciting! You may notice that you’re still being charged a $0.99 fee with each item that sells. Because an Amazon account change doesn’t activate until the beginning of the next month, you will still be charged this fee. Once the month is up, however, consider it waived! If you find yourself paying for the Professional plan as well as the $0.99 fee, contact Amazon’s support center immediately. Alright, now let’s say you decided to go with the Professional account first. Only, you’re not using the features that it comes with and you’re not getting the sales you want. Is there a way you can cancel your Professional plan to get an Individual plan? Click the button that says “Switch Your Selling Plan”. Carefully review the information provided, then click the “Cancel Subscription” button to switch your plan. Ta-da! Now, you have an Individual account! Remember: Your Professional plan will not deactivate until the end of the month. So, you won’t be charged $0.99 per sale until the first of the next month. As always, you’re able to contact the Amazon support staff if you need help! If any of these are wrong, it can cause delays and headaches that could have been easily avoided. It never hurts to look again! Amazon built more than half its business by not collecting sales tax in order to keep their prices low (which helped their items look more attractive)! Unfortunately for you, taxes are a big part of selling on Amazon these days. And of life in general (death and taxes, right?). To verify your tax withdrawal, you’ll need your social security number (SSN) or tax ID number (TIN) of your business. If you’re not an American, you don’t need either of these. So fill out your tax forms (the W12) and submit them; Amazon should verify it immediately. If not, contact customer support. Whew! Now that we’ve talked about taxes, it’s time to talk about something a bit more fun: listing items! Let’s dive in! Great news! If the product you’re interested in is listed in the Amazon catalog, you’re able to add it to your eCommerce store with a click of a button. To do this, head on over to Seller Central and go to the “Inventory” tab. Type in the item you’d like to sell and click “Add item”. Next, you’ll be required to add three key pieces of information before listing the product on your store: condition, price, and item quantity. You’re also able to indicate sale dates and prices, restock dates, and can choose the dates you’d like the items to be shipped. Lastly, you’re able to create a SKU for your product, which is a unique identifier needed in order to manage your items. Amazon will create one for you if you don’t specify one of your own. Go to “Seller Central” and click the “Create a New Product Tool” option. Once there, browse through the categories that your item would best fit under. Enter the information needed, and submit your new product to Amazon. Keep in mind that it may take around 3-5 days for your product to show up in Amazon’s catalog after you’ve created a new product. Important: If you’re attempting to sell car parts or jewelry, Amazon will need to approve these items before entering them into the catalog. Sometimes, Amazon will deny these items (depending on the manufacturer, product name, and UPC of the product). Amazon isn’t very strict, but like all things, there are limits to what you can sell on their website. Things like crime scene photos and illegal drugs are obviously not allowed to be posted or sold, and attempting to sell items like these will result in a deactivated account. Sellers are also required to obtain additional approval for certain items they want sold in their store. For a detailed list of these items, check out this list provided by Amazon. Found your ideal product? Great! This can only mean one thing: It’s time to list and sell these items on Amazon! While we’d love to say that your products will be sold immediately after listing them, we’d be lying through our teeth. There’s a lot to do before your items take off by themselves! Luckily, we’ve gone through this process and we’re here to help you succeed! Grab your pen and some paper, you’ll want to write these notes down. Waiting for your products to sell is perhaps one of the most strenuous things you’ll encounter (other than dealing with customer complaints and returns). Don’t allow yourself to feel defeated! There are plenty of ways to get your products in front of lingering eyeballs on Amazon. Change up your prices. Let’s say you’re selling a pair of headphones for $50.99 and your competitors are selling the exact same headphones for $40. Most customers are inclined to pay less for the same thing. While this means you’ll enter a “price war” with your competitors, it may be one of the main reasons your products aren’t selling. Make sure your products are in demand. Don’t add a product because you think it’ll sell well. Add products that are already selling well! Change up your images. Blurry stock photos aren’t a good way to showcase your items. If you’re drop shipping products, we reccomend getting one for yourself for two reasons. 1.) You’re able to test the product out, to make sure it functions properly. 2.) You’re able to take multiple photos of the product, at different angles. Review your titles. Let’s go back to the headphone example. Let’s say you’re selling Beats headphones, but list your product as “Good Headphones”. Your product listing should say something like “Beats Headphones - Great Condition!”. Not only does it tell your customers what type of headphones they’re getting, it sounds better. You’re also able to create ads within the Amazon marketplace! Click here to find out more about creating ads on Amazon. Want to get instantly notified after making a sale on Amazon? Of course you do! But, how do you go about doing this? Find your “Settings” tab, and open “Notification Preferences”. Go to the “Notifications Options” page, and review your e-mail settings. Update your e-mail, and click on the type of notifications you’d like to enable. Voila! You’ll be receiving notifications in no time, now! For a list of notifications you’re able to receive, check out this page provided by Amazon. Selling items is important to keep your eCommerce store up and running. But shipping items is the most important thing you’ll encounter. Whether you choose to ship sold items yourself or dropship them is entirely up to you. If you’re unsure of what method would work better for you, we’ve got you covered! While shipping sold items is a less-popular alternative, there are people who do it (and do it well)! Go to your Seller Account. Under the “Manage Your Orders” heading, click on your “Recent Marketplace Orders” to locate the order. Verify that the status of the order is complete. Click the order number to access the “Order Detail” page. Once there, you’re able to verify the method of shipment as well as print the packing slip and address label. Pack your order carefully. Label the box “Fragile” if it’s something easily breakable. Purchase postage to ship it according to shipping method specified. Contact the buyer to tell them the order has shipped using the link on the “Order Detail” page. And you’re done! Congratulations, you’ve shipped your order out successfully! Write handwritten notes. This shows the customer that you’ve carefully paid attention to their order and brings immediate satisfaction. Wrap orders in decorative material. If you can, that is. This is just another way to personalize orders to set yourself apart from other Amazon sellers. Communicate with the buyer at all times. Whether you’re unable to fulfill an order or you’d just like to keep your customer up to date on what’s going on. Communicating with your customers helps them feel safe when purchasing an item from you! Did you know that Amazon has roughly 300 million active users daily? Talk about supply and demand, right? If you capture a lot of that market share, you’ll be pretty busy packing and shipping orders. That’s where drop shopping comes in. Drop shipping is a shipping method where your supplier ships the items directly to your customers whenever a sale is made. You never have to touch the products or pack anything! No warehouse cost. Storing an abundance of items gets to be a bit too much after a while. But, hey, if you’d rather store items and ship them yourself, feel free! Large audience to sell to. Remember that 300 million active user stat that we just showed you? That number rises daily! If one of your products became a “popular item” and more than 100 people bought it in a day, would you want to lug around more than 100 packages? No? We didn’t think so! The choice is ultimately yours to make. If it were me, however, I’d go with drop shipping. It simplifies everything and allows you to work on building your store’s reputation. In the time it would take you to ship your items, you can create targeted ads to promote your products as well as your eCommerce store. Another way to ship your products is by using Amazon’s FBA (Fulfillment by Amazon) center. This process is easy as pie, but does involve a bit of work. Add your products to Amazon’s catalog in bulk, one at a time, or by integrating your inventory-management software with Amazon's API. Prepare your products for shipping. You’re able to get the materials needed to ship items from Amazon, too! Next, create your shipping plans, engage discounted partner carriers, and ship your products to any one of Amazon’s fulfillment centers. Amazon fills your orders quickly and efficiently using their advanced, web-to-warehouse, high-speed picking and sorting system. Customers receive their tracking information from Amazon. Amazon will then manage customer inquiries, refunds, and returns for orders on Amazon marketplaces 24 hours a day, seven days a week. Shipping your products to an Amazon fulfillment center will ultimately save you time (and headaches). Not every order is perfect, after all! There will be complaints and returns. By using the FBA, you no longer have to deal with these issues. Thanks, Amazon! It can get costly, as FBA charges based on product weight and seasonal trends. But it’s worth saving the time to scale up your business! To get an estimate of costs, check out Amazon’s FBA fee calculator. Now that you’ve sold and shipped your items, it’s time to get paid. Whether this is your very first payment from Amazon or your 100th, it’s still an exciting feeling! If this is your first time getting paid through Amazon, however, you may be wondering when the payment will clear and how payments work. Never fear, SaleHoo’s here! Provide a valid bank account. This is the only other option you have to get your payment from Amazon. 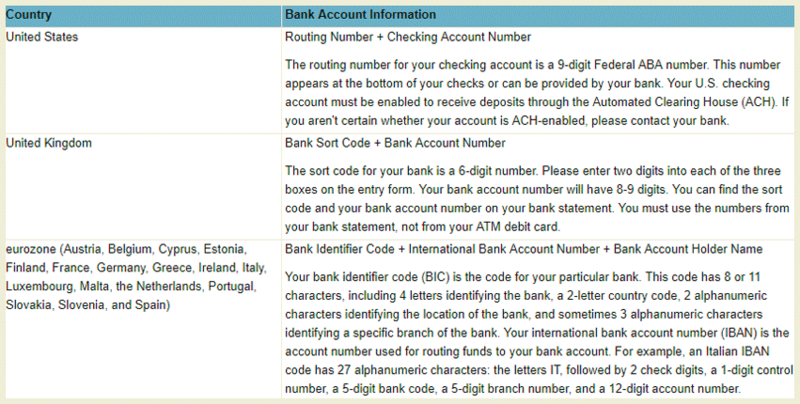 If you live in the U.S., you must provide a verified checking account to wire transfer your money to. Don’t live in the U.S.? That’s okay! Check out what you need to provide Amazon here. Like a credit or debit card, without this information your payments will be withheld until you provide the information needed. We recommend providing this information immediately after creating an Amazon eCommerce store. After your credit/debit card or bank account is verified, you’ll be able to receive the money in your Amazon account. Yay! But, wait… when do you get paid? Read on, young grasshopper. So long as you’ve provided Amazon with the information they need, you should get paid within 3 to 5 business days after making a sale. Remember: Weekends do not count as business days. Meaning, if you make a sale on Thursday, you probably won’t get paid until the following Thursday. If you still haven’t received your money after the 5th business day, it’s a good idea to call your bank's ACH specialist and provide the Federal ACH Trace ID for your bank to trace the funds. Before we move on to the next section, check out this FAQ provided by Amazon that caters specifically to payment questions. Last but not least, we’re going to cover all fees associated with Amazon. From fixed per item fees to variable closing fees, we’ve got you covered! Let’s start off with the basics, shall we? If you’ve got yourself a Professional Amazon account, you don’t have to pay a fixed per item fee! Lucky you! Fixed per item fees are paid by Individual Amazon account holders and cost $0.99 per item sold. While fees can be a bit annoying, we don’t recommend you upgrade your Amazon account unless you’re selling out quickly and want to continue selling on an eCommerce store. Otherwise, you’ll be paying $39.99 per month without reaping the benefits attached to the plan! Shipping fees vary from state to country, but for the most part, Amazon sellers do not have to pay for the sale themselves. The shipping fee is calculated in as soon as a customer purchases an item. However, if the item is labeled “Prime”, there is no shipping fee attached. For a general idea on how shipping fees work, check out this list provided by Amazon. A referral fee is something that Amazon charges every time you sell a product. To sum it up, referral fees are a percentage of the total sales price and usually charges around 15%. Keep in mind that the percentage varies based on the category of the items sold, however! A referral fee can be as low as 6% (for personal computers) and as high as 45% (for Amazon Device Accessories). Check out how referral fees are calculated here! Remember how we talked about Individual and Professional accounts before? With an Individual Amazon account, you pay $0.99 per item sold as well as the referral fee. With the Professional Amazon account, you pay $39.99 monthly and get your fees waived. This means no referral fee for you! Just something to keep in mind when choosing which account plan you’d like to go with! Amazon charges an additional fee known as the variable closing fee, along with the per item fee ($0.99 per item sold). For non-based media items, the variable closing fee is calculated per item and per weight. This can range from $0.45/item to $0.05/lb. If the shipping is expedited, however, the price will range from $0.65/item to $0.10/lb. More than 15% of all Amazon sellers make over $1 million per year. And 10% more make over $10 million per year. That means you have a 1 in 4 chance of being a millionaire selling on Amazon. Pretty cool, right? SaleHoo is here to help you succeed! With our membership programs, you get access to our supplier directory, market research labs (which help you find hot products at low prices), and all of our seller training materials. How's your experience selling on Amazon? Did we leave out any detail our readers should know? Tell us in the comment section below! How does Amazon Prime work into the shipping of products? It is something you sign up for? Do we have a choice to use Amazon Prime for not? Are the shipping costs considered a fee? How do you get your products from the dropshippers list to your Amazon sellers account to sell? Hi Sonyi! Note that you need to sign an agreement with your dropship supplier before you can start selling their items. Some of them provide like an integration tool to easily list items off to Amazon but this is something you'll have to discuss with them first. Otherwise, dopship suppliers provide you with their catalog (normally through a CSV file format) so you can manually list their items on Amazon.